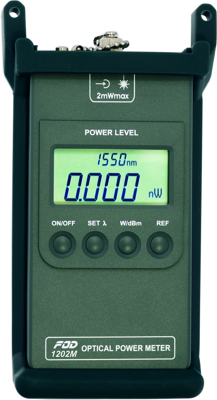 The FOD 1202M Optical Power Meter is field proven, economical, hand-held meters designed for both Singlemode and Multimode applications. Used with CW and modulated signals. When combined with FOD 2107-2115 Light Sources, the pair used for network testing and maintenance application. Protective rubber boot and a soft carrying case included. Changeable adapters: FC, ST, SC, Universal 2.5mm, Universal 1.25mm, LC. The FOD 1204 & FOD 1204H Optical Power Meters are intended for accurate measurements of up-to-date optical communication for both Singlemode and Multimode applications. Specify adapter type when ordering. 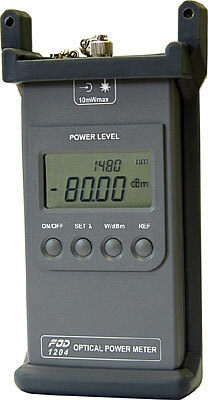 For example: FOD 1204 – ST (Optical Power Meter FOD 1204 with ST adapter). • Calibration of Optical Attenuators, Light Sources etc.